Although the English had attempted to settle in North America before, their first permanent settlement was established in 1607 at Jamestown, and slowly it began to grow, largely on the back of the profitable tobacco trade. 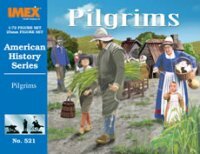 At the time these people were simply called colonists, and it was not until over 200 years later that a historian called them pilgrims, but the name has stuck and now everyone recognises this name to mean the early European settlers of North America. As with all of their civilian history sets, IMEX has spoiled us with the number of poses, although the nature of the subject makes large numbers of identical figures inappropriate. We thought all the poses without exception were great, with all sorts of people working the land, hunting and engaged in all manner of work. The two men firing could also be involved in a fight, perhaps with the indigenous natives, and the man with musket on his shoulders could be guarding the settlement. There are various women and children also doing various tasks, and there is even a minister figure, very appropriate considering the religious motives some of the colonists had for moving to the New World. Most colonists were not wealthy people, and their dress is the simple clothing of ordinary European citizens of the day. The figures show plenty of variety of clothing, but all of it is both accurate and entirely appropriate. The various tools are also correct for the time, as are the muskets, which are fittingly of the simplest design. The detail on these figures is exemplary and without fault. It is often very shallow, which means it can easily be smothered by careless painting, but this is the case in areas which should indeed be very shallow such as one layer of cloth over another, so while this makes painting a little more difficult it is in fact more accurate than the exaggerated detailing often found on figures. We found a handful of bits of flash, but for the most part the figures are very clean. The superb poses, which are very natural and realistic, come at a cost - many of the figures need assembling. For some this means a separate arm or arms, while others have a separate tool or perhaps just a forearm. Putting these together is certainly a fairly fiddly task, although we found this plastic took glue extremely well, and while all parts fitted together very well indeed a minority would need to be held briefly before the glue took a hold. However the delightful models that result more than make up for this effort, and for those that enjoy making kits even that effort will be a pleasure. These are some of the most enjoyable figures we have come across in a long time. While some of the smaller items, particularly the goats and turkeys, will be slightly irksome to those with larger fingers, the time spent in putting these figures together is more than worth it for some lovely poses. A beautifully designed set and a must have for any collection.